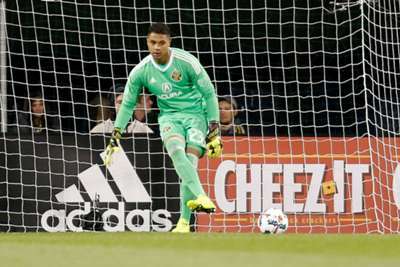 Zack Steffen will deliver on what Pep Guardiola expects from a goalkeeper when he joins Manchester City, according to United States coach Gregg Berhalter. Columbus Crew goalkeeper Steffen was signed by City for a reported £7million and will link up with his new team-mates in Manchester on July 9, when the MLS transfer window opens. Guardiola deemed Joe Hart's ability with his feet insufficient upon his arrival from Bayern Munich in 2016 and moved him on, settling on Ederson as his number one after Claudio Bravo endured a shaky debut season at the Etihad Stadium. Berhalter coached Steffen at the Crew and thinks the experience he earned playing out from the back in Columbus will prove key for the 23-year-old, who was named US Soccer's Male Player of the Year on Tuesday. Asked by Omnisport if he felt Steffen had the ability to establish himself as a long-term Premier League player, Berhalter replied: "Yes. I'm very comfortable in saying that. "He has the skill set for such a young age, being such a calm goalkeeper, he's very explosive, good with his feet, I think he has a future in the Premier League. "[Using his feet] was a very key thing player under our system [at the Crew] as well. He's comfortable with it, he knows what's expected of him. "He's working on it and I think with Ederson they have probably the best in the league right now, but Zack I think is good and he's going to get even better." Steffen agreed a move to Freiburg in 2014 but returned to the USA two years later after failing to make a first-team appearance in Germany. A loan to Pittsburgh Riverhounds followed and Berhalter believes those experiences helped the keeper in his development. "Everyone in their career experiences setbacks and I think the important thing when Zack came back to Columbus is we had a plan and he understood the plan, he accepted the plan and he worked very hard to execute the plan," said Berhalter. "He went out on loan in USL in his first six months and he got games and we eventually got him to a spot where he was competing to be the number one. "He won the number one spot and we've seen his progression both on and off the field. I think his maturity is at a different level than it was before, his poise is exceptional in big moments and he's improved in almost every area of his game. "I'm confident he's going to continue to improve and become the goalie we expect him to be."